Steak, mushrooms and sweet onions make a perfect dinner for Father’s Day. Since its Dad’s day to relax, put the grill away. This steak, mushrooms and onions are sautéed in the same pan. The balsamic and garlic marinade become a dipping sauce for the sandwich. Meaty portobello mushrooms are perfect for this dish. Buy whole ones and sliced them after they’re cooked. A tapenade is a thick paste made from capers, olives, oil and vinegar. For the tomato tapenade side-dish, buy a good quality tapenade and mix with sliced tomatoes. Remove visible fat from steak. Mix garlic and balsamic vinegar together in a self-sealing plastic bag. Add the steak and mushrooms. Marinate 10 minutes, turning bag over once during that time. Heat a large skillet over medium-high heat. Spray with olive oil spray. Remove steak and mushrooms from marinade, reserve marinade. Pat steak dry with a paper towel. Add steak to the skillet. Saute 5 minutes. Turn steak and sauté 2 to 3 minutes. A thermometer should read 135 for rare and 145 for medium-rare. Remove steak to a cutting board, add the mushroom and onions and cook 5 minutes, turning over once. Remove to the board with the steak. Add the reserved marinade to the skillet and boil 3 minutes to reduce by half. Divide sauce between 2 small bowls to be used for dipping the sandwich. Slice steak and mushrooms into thin strips. Arrange meat and mushrooms on bottom half of the bread and place onions on top. Add salt and pepper to taste. Cover with the top slice of bread and cut sandwich in half. Serve with the dipping sauce. Makes 2 servings. Place tomatoes on a plate. Sprinkle with salt and pepper to taste. Spoon tapenade on top. Makes 2 servings. 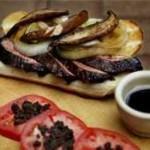 To buy: 1/2 pound skirt steak, 1/4 pound whole Portobello mushrooms, 1 Vidalia onion, 2 tomatoes, 1 can olive oil spray, 2 whole wheat hoagie (submarine) rolls (about 2 ounces each), 1 jar minced garlic and 1 jar olive tapenade. Staples: Balsamic vinegar, salt and black peppercorns. You can use flank or your favorite other quick cooking steak for this recipe. Any type of bread or roll can be used. If Vidalia’s are not available, use a sweet onion such as Texas 1015’s or a red onion. Minced garlic can be found in the produce section of the market. While steak marinates toast rolls and assemble tomatoes. Make steak and vegetables and make sandwich. 06/10/15 - Today on Topical Currents: Miami’s vast feral chicken population has become streetwise. They avoid those charged with rounding them up as adroitly as a street drug dealer. 06/09/15 - Everyone makes prejudicial judgments . . . but exposure to groups and individuals can mitigate them.